When I first got this book, I was intrigued by the format but honestly didn’t know what to expect. Now, almost three years after reading book one, this series s still one of my all-time favorites. Review In A Nutshell: Illuminae is an epic, impactful novel sure to be one of you favorites. Illuminae is a completely unique book. This first book follows Kady Grant and Ezra Mason, as well as the other survivors of the brutal genocide attempt on their home planet, Kerenza IV. They are part of the fleet of three ships that managed to escape the attack, but their chance of survival is slim with a powerful dreadnaught chasing them, determined to get rid of all the witnesses. Throw in a mysterious but deadly plague and a psychotic AI system, and this book is sure to have you hooked. This book is full of action, mystery, and overall awesomeness. The pace is fast, the plot is filled with surprises and twists. There is a lot of information to absorb, being thrown into the world set over 500 years in the future, but the information is dropped in unique and interesting ways that make it easy to forget that this is all fictional. Intricate themes are woven beautifully into this great story, as the characters desperately cling to any chance of survival. 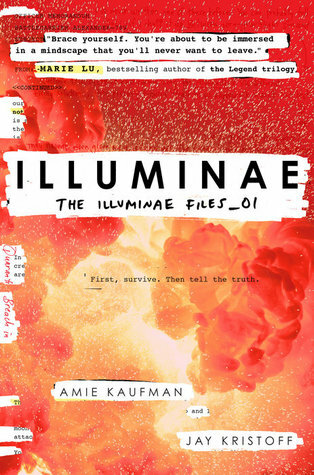 Illuminae discusses humanity, and good vs. evil, and what sacrifices are necessary in times of war and desperation. Despite the heaviness of the topics, the pages fly by thanks to the brilliant writing style with its perfect balance of hilarious wit and thought-provoking moments. Amie Kaufman and Jay Kristoff take you from scared, to laughing, to crying, all in the span of a couple chapters. The characters of this series are stars. They demand attention. They are all dynamic, well written, and interesting in their own way. Kady and Ezra are both strong protagonists who each have equally compelling arcs that blend beautifully into the story. They are both completely relatable and grounded while having distinct and entertaining personalities. AIDAN, the AI, is my personal favorite part of this book and probably this series as a whole. His character is absolutely fascinating, toeing the line between hero and villain, so human-like yet so monstrous. I could talk for days about him as a character and probably would if I had the chance. I’ve seen a lot of fictional robot/AI characters and none of them hold a candle to AIDAN. Kaufman and Kristoff aren’t afraid to go there with this character and the series is so amazing because of it. Another aspect that truly stands out in Illuminae is the format. The story is told through emails, IMs, schematics, transcribed surveillance footage, and various other types of files. It just adds to the suspense and adds so much to the experience. I will say, there is a bit of a curve to getting used to the format. It’s definitely a different reading experience than the typical prose novel. However, it is 100% worth it. Just stick with it through the interviews and fictional-wikipedia pages in the beginning, and you will adore this book. If, for some reason, you find yourself hating the format of this book, then I beg you to try the audiobook. It has a full cast, adapts the unique format well, and is just absolutely amazing. Kaufman and Kristoff killed it with this series. Honestly, I can’t think of a single book to compare to Illuminae. It is amazing in every way. Illuminae is phenomenal. This unique, spell-binding book is sure to have you addicted and immediately reaching for the sequel.